Thiele-Small parameters are measured with just a bare loudspeaker. 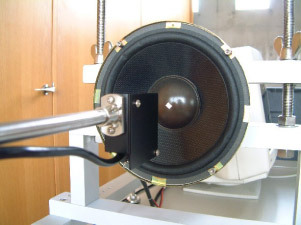 The Thiele Small (T/S) parameters are derived by measuring the displacement of the cone paper of a loudspeaker under test, using a laser displacement sensor. There is no need for added mass or mounting in a sealed box to add stiffness for measurement. 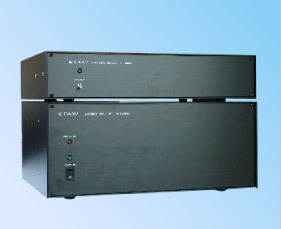 A single loudspeaker is all that you need for obtaining the T/S parameters. The multiple measurements are remarkable in its ease and speed of operation. Easy software can be operated by anybody. Once you set up to 10 different conditions (voltage/displacement), the system automatically carries out a preliminary measurement to reduce the measuring time followed by a main measurement and the results are promptly displayed. A well-built speaker mounting jig. Sine wave measurement ensures high S/N ratio and even low voltage can be measured. 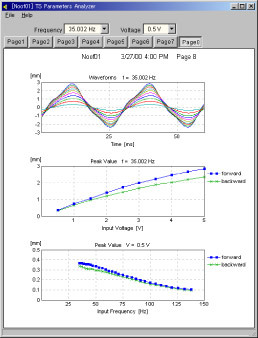 T/S parameters can be easily measured even while applying a displacement. Distortion of moving components can be analyzed.